Clandestine Drug Lab Cleaning is required when hidden amphetamine and illegal production rooms are found by the authorities. Clandestine Drug Labs contain toxic chemicals and substances and are usually highly explosive. Once the Authorities have finished investigating a Clandestine Drug Lab, the mess is left to the owner of the property to clean up. 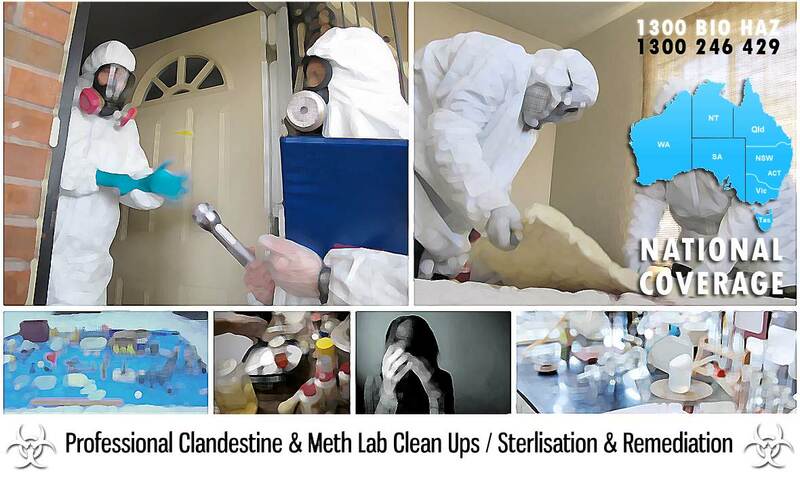 Due to the highly toxic and dangerous nature of the substances used in these Clandestine Drug Labs, the clean up is something that is best left to the professionals rather then attempting it yourself. Correct clean up of a Clandestine Drug Lab can include the disposal of furniture, carpets, tiles, fixtures and anything else that is porous and can absorb the toxic chemicals. Failure to correctly clean up a Clandestine Drug Lab can leave a property toxic for years to come. Don’t put your family at risk, and get Professional Clandestine Drug Lab Cleaners into your property.